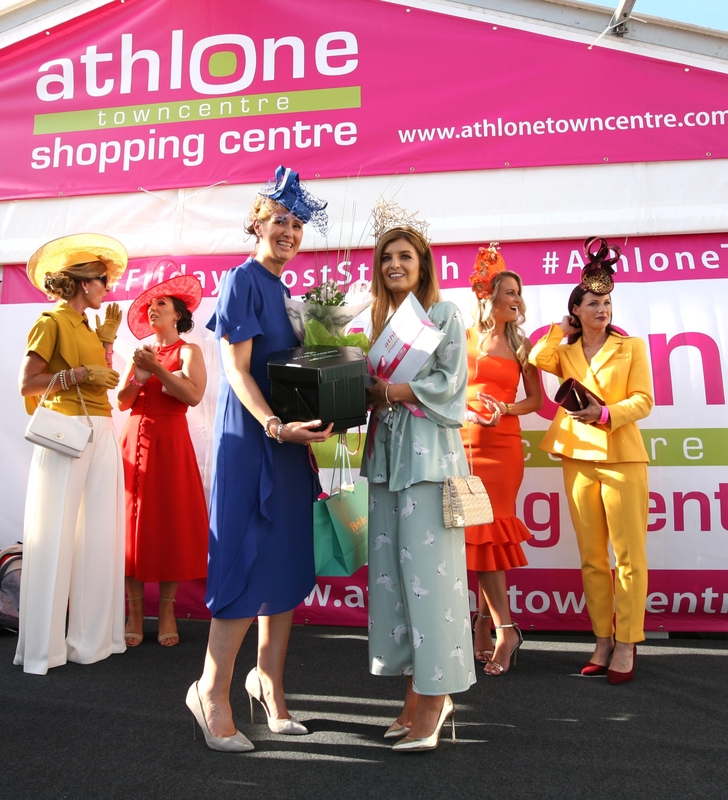 Caitriona Coyle from Killeigh, Co. Offaly has been announced as winner of ‘Friday’s Most Stylish’ sponsored by Athlone Towncentre at this year’s Galway Races. Wearing a flowing patterned mint kimono style jacket and cropped palazzo trousers from The Walk in Wardrobe, Banbridge, Caitriona elevated her look with a structured wicker summer handbag and gold stilettos both from Zara. She completed her race going outfit with a gold crown style headpiece designed and made by Laura Hanlon. The easy elegance of her outfit perfectly complemented Friday Summer evening racing in Ballybrit. One of the key reasons Caitriona was chosen as winner of the Style Competition was how she created a wholly individual look incorporating pieces from high street stores and independent boutiques which is reflective of the offerings the variety of retailers housed in Athlone Towncentre host. Caitriona takes home the biggest Prize Fund on offer for the competition yet, which is worth in excess of €3000. She has won a €1500 Athlone Towncentre shopping spree, a two night luxury hotel & spa break at Sheraton Athlone Hotel, a Gucci Watch courtesy of Fields The Jeweller and bespoke head piece created by Milliner Suzie Mahony plus racing hat hire for the year. ‘Friday’s Most Stylish’ has proven to be one of the biggest gatherings of race going fashion lovers to date on the Friday of the Festival. Celebrity judges Anna Geary, Broadcaster, Athlete, Performance & Wellbeing Coach and Marietta Doran, Fashion Stylist & Racing Style Presenter were joined by Guest Judge Stylist Rebecca Rose who won the competition last year. Rebecca is building a successful career as a Professional Stylist following her own win of ‘Friday’s Most Stylish’ in 2017. With the competition in its sixth year, the spotlight has been on fashion forward style mirrored in the contemporary retailers resident in Athlone Towncentre. Social Media fans can check out behind the scenes action on the Athlone Towncentre Facebook and Instagram accounts as fashion bloggers Two Broke Divas took them over for the day. Some of the beautifully dressed race goers in Galway for ‘Friday’s Most Stylish’ competition can be viewed on the social media accounts. Athlone Towncentre is home to major fashion brands including Zara, River Island and H&M as well as boutiques. It is an ideal shopping destination with over 60 brands under one roof as well as numerous food offerings catering to all tastes.